THE PROCESS OF PRAYER NEVER ENDS.The Father has issued a clarion call for His children to get acquainted with Him. 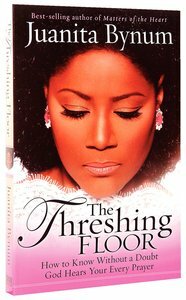 Juanita Bynum wants to bring you to the threshing floor - the place to total surrender to Him in prayer and intercession. From the outer court to the most holy place, she offers prophetic insights and biblical explanations to help you move through progressive steps of prayer. Bynum invites you into a deeper and more intimate relationship in the process of purification. Rise above your natural circumstances. Tap into the supernatural realm, where you will find love, peace, contentment, and the solution to every problem you face - if you will answer the call to pray. Come; God is calling you to the threshing floor...where true intercessory prayer begins. Discover how the seed of true prayer is separated from the chaff of selfish desires. Encouraging you to carry the needs of others to the Lord, Bynum offers practical advice on becoming a "doer" of the Word and a "living sacrifice" as you learn to pray with power. Includes in-depth questions and journal pages.